If you're a fellow Nerdy History Person, then likely you, too, spend a great deal of time looking at images on the Internet, squirreling them away in endless desktop files and on Pinterest. Sometimes those images just seem to belong together, whether there's any historical reason for them to be linked or not. To me, the portraits of these two ladies look like long-separated friends. Both were painted in the early 1770s. The lady, upper left, is now unknown, her identity lost over time. 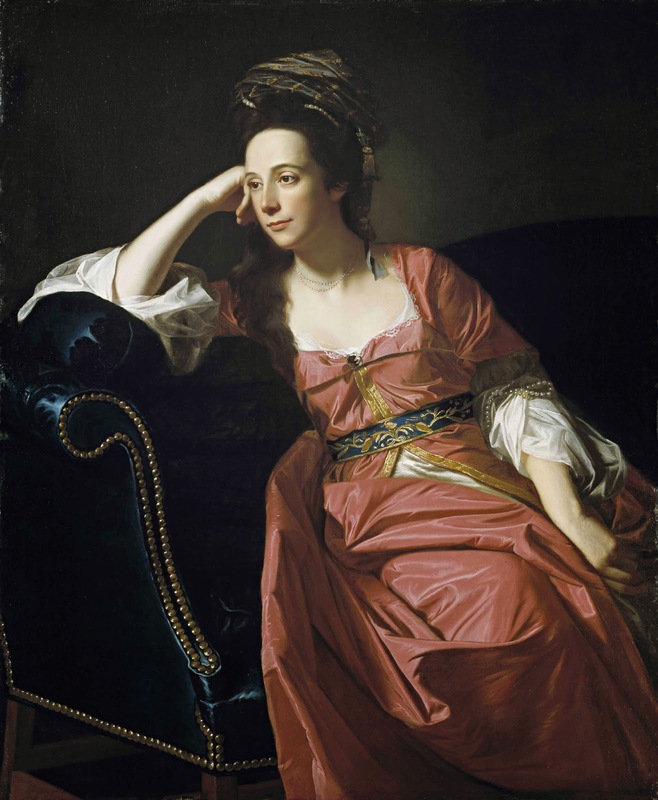 She was painted by Joseph Wright around 1770, and most likely in Liverpool. From the luxury of her clothes and setting, she was obviously wealthy, and she is shown at her genteel needlework (I think it's netting), her gold-fringed work bag on the table beside her. One authority speculates that she was "nouveau riche." Wright was working hard to establish his career as a portraitist, competing (and, to his frustration, not succeeding) against the big names like Thomas Gainsborough and Sir Joshua Reynolds for more fashionable commissions. So it's likely that this woman was a prosperous merchant's wife, not a titled lady, and as lovely as this portrait is, it wouldn't have been copied as an engraving to be sold in print shops, the way portraits of royalty and the celebrities of the day would have been. It's a very different case with the second lady, lower right. Margaret Kemble Gage was born in New Jersey to one of the more socially prominent and well-connected families in the colonies, and she had furthered her position by marrying Thomas Gage, the commander-in-chief of the British forces in North America. His officers referred to her as "The Duchess," and her beauty and charm made her place in New York society before the Revolution as close to nobility as the city possessed. She was painted by Boston native John Singleton Copley (1738-1815) in 1771. The portrait received considerable acclaim, and in 1772 was sent to London, where it was displayed at the Society of Artists. Copley was the most accomplished of the colonial artists, prodigiously gifted. It's impossible to know how he became so skillful so far removed from the artistic centers in Europe. He would have seen the work of Gainsborough and Reynolds as well as of Old Masters only through line engravings, and perhaps painted copies owned by his wealthy patrons. He longed for the opportunities and inspiration of Europe, and in 1774, on the eve of the American Revolution, he finally sailed for England, never to return. It's highly unlikely that these two portraits could have influenced the other, or that each artist even knew of the other portrait's existence. They were painted at the same time, with an ocean between them. It's pure but uncanny coincidence that both ladies are dressed in the same old-rose color silk, and the same style costume, a Turkish-inspired form of fancy-dress/casual clothing called a sultana, a popular choice for 18th c. portraits. They're both wearing this costume with stylish, daring informality, the relaxed shape of their bodies and breasts showing they're without stays. Patterned sashes, gauzy scarves, and strands of pearls woven through their hair and around their sleeves complete the sense of exoticism. Yet as much alike as their costumes are, I think it's how their faces are painted that made me link them together in my head. Both are undeniably beautiful women, but their beauty isn't idealized and flattered into bland prettiness, the too-aggressive Photoshopping of the 18th c. These two ladies are painted as individuals, as women you'd like to have conversations with; they look interesting. If I were one of them, this is how I'd liked to be painted, too. But that's just my rambling. What do you think of these two portraits? Which do you prefer? For more about 18th c. sultanas, please see this subsequent post. Above: Portrait of a Woman, by Joseph Wright (Wright of Derby), c. 1770, Metropolitan Museum of Art. 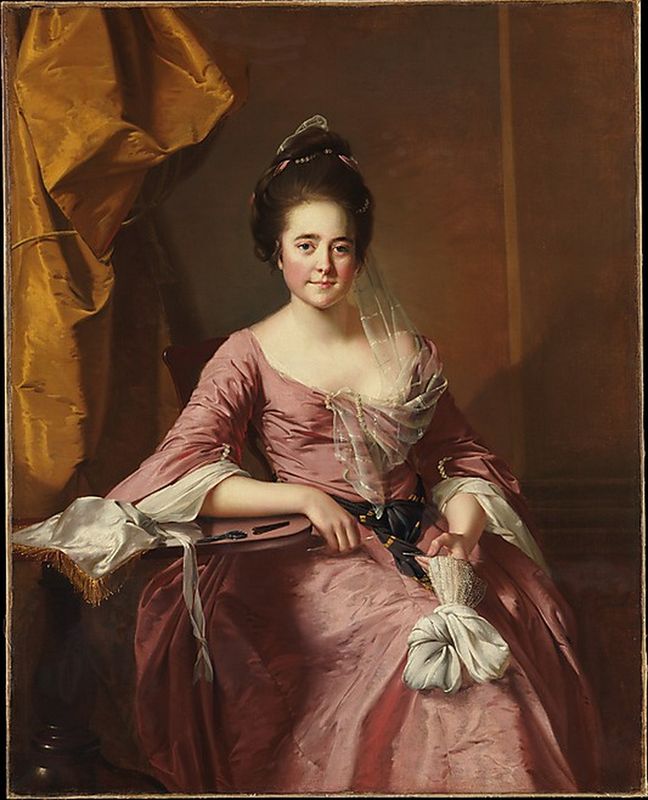 Below: Mrs. Thomas Gage, by John Singleton Copley, 1771, Timken Museum of Art. I like the Copley, but surely not because of his loyalty to his home country or his enormous ego. While both women are wearing the sultana style gown, Copley is a little more serious about it. He paints his subject draped on a settee, while the English lace-maker sits more stiffly in a chair. Most early Turquerie paintings showed women on a sofa-like piece of furniture. And Copley has a serious turban on Mrs Gage's head, while Wright wraps a little lightweight gauze around his subject's hair. I do like this blog posting! What is the unknown woman holding in her hand? I like both pictures, and here's a theory to the similarities: fashion plates. I read a very good book on that once (lots and lots of sources quoted and images), and apparently even after the revolution the inhabitants of the former colonies copied the fashions of the old world even though it was considered unpatriotic. So it makes sense that pre-Revolution, they did of course get the European fashions, via plate or maybe even via fashion doll (a life-sized doll all dressed up; thoughts of Paris Hilton popping up in my mind are surely coincidental?). I can really imagine both of them studying the fashion plates - maybe in search for a new dress for that portrait they meant to have taken? - , going "that style is just perfect!!" and being off to their trusted dress-maker. As you pointed out: the similarities are noticable. The pearls, the lovely white, finely draped fabrics in a semi-turkish style... and the artists did such a beautiful job capturing it! The way the light illuminates Margaret Kemble Gage reminds me of Vermeer. I think the unknown woman may be holding a piece of fabric which she is decorating with a fine, lace-like border. The needles really look like knitting needles and if she works on something big like a shawl or night gown it would make sense to carefully coil the fabric so it doesn't crumple or get into the way. I have always had a fondness for the Copley image, being a native of San Diego and having visited the Timken a number of times before I moved to Virginia. I always liked her because while yes she is very beautiful, she is an American painted by an American artist--a rarity to see in West Coast art museums! While I love gazing at the pictures of lords and ladies, it is equally rewarding to see the great portraits painted by your country's artists--and that the elite of the colonies could be as fashionable as the nobility of Europe. Your questioning how Copley got so talented in the colonies does sound a little snobbish--perhaps you are just mirroring the opinions of your English characters! Some people are just born with talent, no matter what side of the Atlantic they were born on. It seems too much of a coincidence that the outfits match so exactly--is it possible that the artist who painted the unknown lady painted her after the Gage painting made it across the Atlantic and copied that painting? bubbleandsqueak - I like your theory of the fashion plates, and I like imagining the ladies on both sides of the Atlantic studying the latest styles from London. But alas, that's not the case with these two. What they're wearing are costumes, most likely supplied by the artists. Artists kept small wardrobes of fanciful attire, and the same costumes turn up again and again in different portraits. Michelle, I'm a great fan of Copley, and like you, I love how American his portraits are - even before there truly was an America. I think, however, you might have misinterpreted my comment about how amazed I am that Copley produced work at such a high level while in the colonies. I did not intend to compare him unfavorably to the English painters of the time, or to look down on him because he was American. Rather, I really AM amazed at how he was able to create the paintings he did - paintings that are every bit the equal, and in some cases, much better - than what was the fashion in London. He did this without the academic training that European artists had, without serving as an apprentice to a master to learn the tricks of mixing paints and preparing canvases as well as painting itself, and without exposure to the great paintings by earlier artists. His New England portraits are a testament to his very real artistic genius. It's particularly ironic that once Copley finally did go to London, his work suffered from the influences he absorbed there (as well as his own ambition), and his later paintings lack the magic of his earlier American portraits. John, I wish that were so! It would have been a tidy answer to the question if Joseph Wright had seen J.S. Copley's portrait on display, sketched it, and painted the same costume on the unknown woman. Over on my Facebook page, Catherine Curzon found the unknown woman's costume in another portrait by Wright, too - "Mrs. Catherine Swindell". 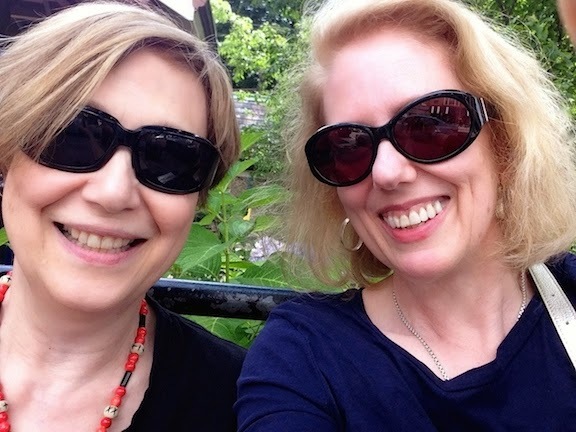 Scholars (hmm, not Wikiart!) seem to date this at 1769-70, and place it with the other portraits done in Liverpool. In other words, before the Copley portrait.